I don’t know quite how it slipped through the net, but until now I had never read ‘1984‘. As it’s on our 100 greatest novels reading list , I thought it was time I rectified the situation. There can’t be many books that have been plundered as thoroughly for cultural references. The thought police, Newspeak, Room 101, and, of course, Big Brother, have all developed cultural identities of their own – not to mention spawning multiple television series. If a novel or film generates huge media hype, it’s a tough call to meet those raised expectations. In 1978 the UK went nuts for the film ‘Grease‘. Everybody in my school got to see it except me, thanks to the intervention of a church busybody who advised my parents to shield my fragile soul from such a corrupting influence. I was furious. I was heartbroken. Worst of all, I was ostracised from the entire universe and all of my friends because I couldn’t contribute anything to their discussions of Sandy and Danny Zuko. When I finally got to see the film ten years later, it was a total let down. But with my expectations so out of proportion, how could it possibly have been anything else? 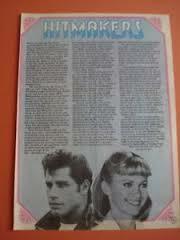 This is a page from my prized possession; the ‘Grease’ edition of ‘Disco 45’. I became the ‘Grease’ lyrical content expert in my school to make up for my viewing inadequacies. Having heard so much about the novel over the years, I suspected that reading ‘1984‘ would be similarly underwhelming, and I was right. What I wasn’t expecting – and George Orwell lovers should look away now – was that I’d absolutely hate it. I enjoyed ‘Animal Farm’, so I was unprepared for the blandness of the writing. It was insufferably dull. I find it remarkable that Orwell could write a story thick with the claustrophobia of surveillance, the perils of engaging in illegal behaviour with all the associated risks and bleak consequences, not to mention scenes of torture, but manage to make it sound so pedestrian. I’ve been going over the text to try and work out what was so frustrating and I’ve narrowed it down to two things. Firstly, Orwell suffers from a serious case of ‘why say something once when you can say it in a multitude of times’. For instance, Winston’s oft repeated descriptions of the gestalt shift between crippling fear of being caught and anaesthesia of idyllic self-denial that the lovers experience during their trysts, not only gave me a sense of deja vu, but drained the emotional impact of scenes which should have given me knotted shoulders from the mounting tension. Secondly, all those endless turgid passages describing Winston’s thoughts and feelings are the perfect demonstration of why writers should show, not tell. Yawn! I think that what frustrates me most of all is that these are easily rectifiable symptoms of writers’ laziness. A good edit and a re-write could have done wonders, but it won’t stop me condemning ‘1984‘ to Room 101. 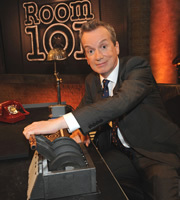 I just hope I’ve been convincing enough to make Frank Skinner pull that lever. ← Waiter! There’s hardly any revolution in my soup. Orwell’s quote about writing, I haven’t read 1984 since I was about 18, so I’m guessing your recent reading suggests he doesn’t follow his own advice and he could have put it more shortly? Talk about ‘do as i say, and not what I do!’. I realise I’m going out on a limb criticising such an acclaimed author as Orwell, especially as he wrote about the process of writing himself, but that’s a decision I’m prepared to live with. To be fair, there were passages that worked, and descriptions of people that were vivid and precise, but I think they were swamped by the fields of bland. I remember devouring this book, maybe his pedestrian style was to show the monotony of a world without imagination and spontaneity. That could explain the repetition of thoughts as well, at least that is my theory and I will stick to it like the Catholic church did to the flat Earth belief. I do wonder whether being so pioneering when it was published, ‘1984’ went on to inspire a whole publishing apocalypse of dystopian novels that have ultimately reduce the impact of the original. I’m surprised I responded to it like I did, and wonder whether it’s one of those novels that have an ideal age reading window, a bit like ‘Catcher in the Rye’ does, and I basically missed the bus by a couple of decades! Same here, I read Catcher as wasn’t impressed at all, I expected the hype to have something to it but was sadly disappointed. I suppose the more you read, the more books become redundant which is a paradox in itself, maybe. The irony of the novel is in how the dogma of the society portrayed is dogmatically written. I prefer Brave New World for its unresolvable question about the nature of the good life because this leaves readers with having to deal with the question on their own terms. What Orwell does is bludgeon with his own views. At least, I suppose, he pulled off a trick by making his dogma stand somewhere, contra the arbitrarily changing dogma in 1984. I came over here ready to give you hell for this but I’m amused by your response to the book. I think you’re right about expectations having an affect, they polarise what might otherwise be, ‘meh, it was alright’ takes on things. Admittedly, my expectations were high – I can’t think of another novel that has contributed so many of its aspects and phrases to popular culture I really was expecting something life-changing and yet I found the reading experience so flat. Mind you, it didn’t help that I was still basking in the glow of Huxley’s ‘Brave New World’ which I found far more powerful and dramatic.